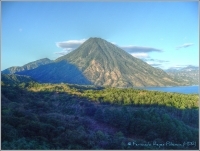 At first glance, Lake Atitlan may seem like any resort destination, a picturesque, tranquil place to rest and relax. Yet, this is the heartland of traditional Mayan culture in Guatemala, ringed by several dormant volcanoes and verdant forest rich with wildlife, waiting to be explored. For the active, summiting Volcan San Pedro is a truly off-the-beaten-track challenge; without a local guide and a machete to cut through the brush, the trip can be dangerous, even for the most experienced trekkers, but therein lies the fun! There are also plenty of other excursions, such as motorcycling and paragliding through surrounding areas, as well as kayaking and cruising on the lake. Panajachel, a hippie haven in the 60s, offers good tourist amenities and a bohemian atmosphere that will be familiar to many travellers. The surrounding villages, however, are places to learn about local folklore, arts and crafts handed down by many generations of Mayans. Come here and leisurely explore all of them as a welcome guest, which, in combination with the numerous adventure activities available, make Lake Atitlan a richly rewarding resort stop. We are looking for contributors for our Lake Atitlan travel guide. If you are a local, a regular traveller to Lake Atitlan or a travel professional with time to contribute and answer occasional forum questions, please contact us.